Feeling Anxious? Just Eat Pickles and Sauerkraut. Pickles and sauerkraut sure aren't a way to make new friends -- unless you enjoy the company of people who love farts. In that case, well, you've interesting taste in friends. 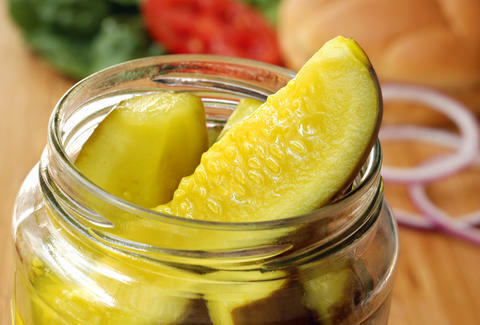 But a new study suggests there's a connection between eating fermented, probiotic-rich foods such as pickle sauerkraut, among others, and feeling less social anxiety. Really adds a whole new meaning to "cool as a cucumber," right? Researchers at William & Mary and the University of Maryland found that young adults who eat lots of fermented foods apparently have fewer symptoms of social anxiety, but the connection is particularly strong in people who are "high in neuroticism," according to a summary of the study via Science Daily. Maybe Woody Allen just needed to eat sauerkraut all along. Ultimately, it comes down to your gut influencing your mind, according to the researchers. When probiotics in fermented foods change conditions in your gut, they may make you feel better and less anxious. The study is based on responses from about 700 college students and will be published in Psychiatry Research this August. No word on whether or not the study included fried pickles or picklebacks, however. Tony Merevick is Cities News Editor at Thrillist and could eat a whole damn jar of pickles, so no wonder he's so cool. Send news tips to news@thrillist.com and follow him on Twitter @tonymerevick.